It’s always an exciting day when the first absurdly exclusive supercar ends up in a ditch, or perhaps a lake. It give us filthy poors a nice helping of schadenfreude, and it gives the company great PR because it shows not every car they sell ends up immobile in a climate-controlled garage. Some really do get driven hard! Into ditches! 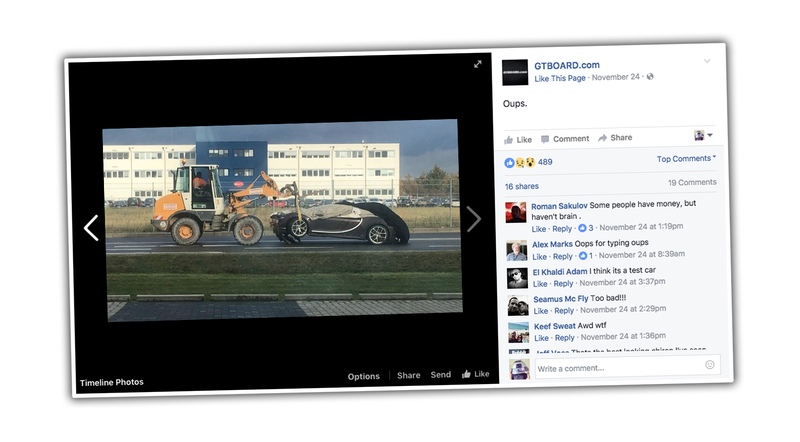 This photo of a wrecked Bugatti Chiron does seem to show the aftermath of what happens when you lose control of a 1500 horsepower trust fund on wheels, but I think the picture is a little deceptive. According to Bild, the accident happened in Wolfsburg, where the Volkswagen Group, Bugatti’s parent company, is headquartered. The Chiron appears to be on a VW test track, and it’s quite possible this Chiron is a test mule. This was likely a test driver on, as the commercials tell us, a closed track. I’m sure once these get into the smooth, lotioned, and manicured hands of private buyers, we won’t have any issues like this as the cars are piloted with prim care along the streets of Beverly Hills or Dubai, possibly with hazard lights blinking because, you know, safety first. So, yes, this is the first Chiron to wreck, but I suspect we still have a first private Bugatti Chiron wreck coming sometime in the nearish future. So stay alert!